In my last two interviews, one with Dr. Peter Olson, Geophysicist from Johns Hopkins University, and Dr. Nicola Scafetta, Applied Physicist from Duke University has sparked my curiosity to apply an additional direction to my published “Equation”. Still, the Sun is no doubt the origin of all interactive play. (at least in our solar system, but this will be explained in my book “Cosmic Rain” due out late spring.). The Sun is the triggering mechanism for a causal chain reaction to what happens on our home planet. One might say for all planets…in our solar system. What I have been learning lately is what slower acting, but perhaps far more powerful effect the Sun has on the Earth’s core. What we all agree upon (myself and my distinguished guest Dr. Olson and Dr. Scafetta) is the Sun is the primary cause for our climate and weather. It is pronounced and almost instantly in active effects. But what is going on below is far more powerful but disguises in a stealthy slow moving mannerism. The old story of the frog in the slowly heating pot comes to mind. Although most of our scientific equipment is pointed towards the sky (satellites, telescopes etc,) to measure the Sun’s activity and its effect on our magnetic field, ionosphere, stratosphere, and as of late our “weather” (see equation), not much has been disclosed or known about what lies beneath our feet. So lets take a closer look. In very much the same way as lightning strikes, so does the Earth’s highly charged core. Did you know when we think we see a lightning bolt hitting Earth; it is actually met with a matching bolt from the ground shooting upward? That’s’ right. A lightning bolt rises from the ground and meets a lightning bolt from the sky up to several hundred feet in the air. With this understanding, and upon Dr. Olson’s studies of the Earth’s core, mantle and crust, I am suggesting the solar flares, CME’s, and various space emitted charged particles, having a similar “reverse charge” in the same manner as lightning bolts. More on this later, but first let’s take a look at what is the “South Atlantic Anomaly”. Earth is surrounded by a close-to-spherical magnetic field, the magnetosphere. According to what we know today, it is being generated by dynamo action in the Earth's interior where conducting liquid metals are kept in motion by the forces of convection (heat exchange), coriolis, and gravitation, and just as the charged windings in the coil of a dynamo generate a magnetic field when moved, these masses create the Earth's magnetic field. Without it, our compasses wouldn't work, there would be no northern lights (auroras), and it protects us from space radiation by deflecting high energy particles from deep space or by capturing them in the so-called Van Allen Belts. Of these, discovered by the first US satellite, Explorer 1, in 1958, there are two, one closer, the other farther away, and both surround the Earth like a doughnut. 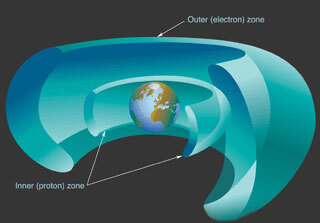 Unfortunately, at a certain location over the South Atlantic Ocean, off the coast of Brazil, the shielding effect of the magnetosphere is not quite spherical but shows an unusual distortion, which scientists explain as a result of the eccentric displacement of the center of the magnetic field from the geographical center of the Earth (by 280 miles) as well as the displacement between the magnetic and geographic poles of Earth. This is to say Magnetic North is not consistent with Geographical North. At times this area becomes very unstable and “bounces” kilometers apart. But there is more to this “unpredictable” monolithic anomaly than many in the science community had ever known…until now.